Hi! 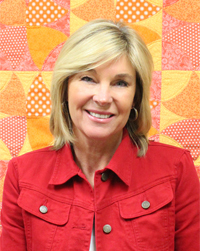 I am Jill Repp and I have been developing products for June Tailor, Inc. for 20 years. Inspiration can come from anywhere and the idea for this T-Shirt Transformation Ruler came to me as I was making a t-shirt quilt for a dear friend. Creating a t-shirt quilt is a perfect example of “Measure Twice, Cut Once” because there is really no room for error on your loved one’s favorite tees. The easy part of the project was sorting through the treasured t-shirts and selecting which ones to feature in a quilt. What proved to be a bit more challenging on my first t-shirt quilting adventure was centering and marking the motif in preparation for cutting and sewing. 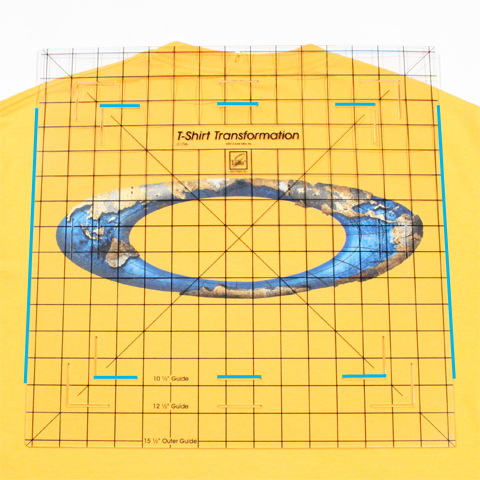 The June Tailor T-Shirt Transformation Ruler was born of this experience! It is designed to center, mark and cut three different size square blocks — 10″ finished, 12″ finished and 15″ finished — and many different size rectangular blocks by using different combinations of inner and outer marking guides. 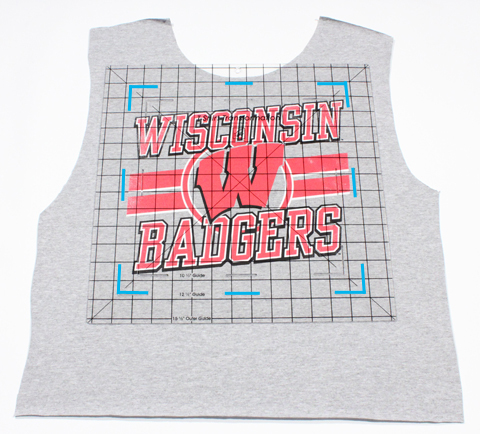 Our June Tailor T-Shirt Project Fusible interfacing is a necessary companion piece to the t-shirt quilt making process. 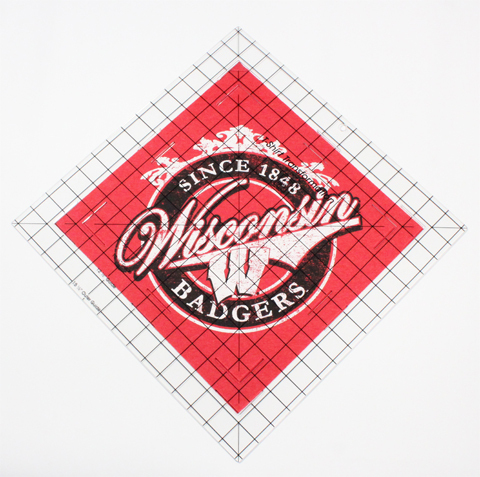 This 100% cotton woven fusible interfacing comes in a generous 60″ x 72″ cut. Our fusible interfacing was created specifically to stabilize t-shirt knits and to prevent distortion and stretching during the marking, cutting and sewing of these blocks. Now, let me show you how to use these tools to create your blocks. Select your first t-shirt and rough cut along the side, shoulder and neck seams. Smooth it out with your hands — you’ll want it to be flat before you apply your fusible. If your t-shirt has been stored for a long time it may need a pressing before you begin. Be sure to protect your t-shirt motif with a pressing cloth so you don’t melt or ruin the design. The next step is to cut your T-Shirt Project Fusible Interfacing. Cut this about an inch or so larger than your intended block size. Center the textured side of the fusible on the wrong side of the t-shirt. Next, adhere the fusible to the t-shirt fabric. Use the pressing cloth again to protect your t-shirt motif from heat damage and your iron from residue. Press firmly and be sure that you are pressing all the way out to the edges of the interfacing. Now you are ready to begin creating your first block. Place the ruler on the right side of the t-shirt over the motif. Note the intersecting lines in the center of the ruler. These will help you locate the center of your motif. 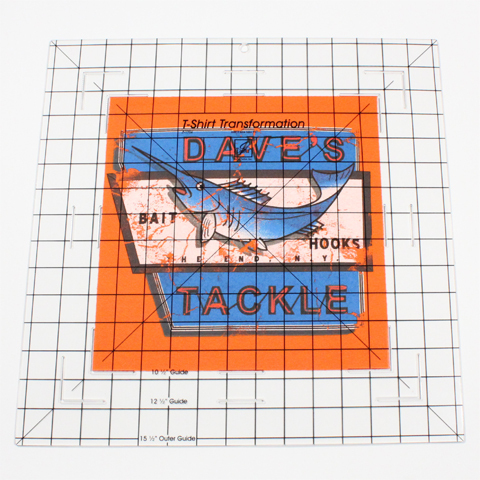 The grid markings on the ruler are one-inch square for additional guidance while aligning. With the ruler in place, you can easily see the motif and can begin alignment of your square or rectangle block. The outer edge of the ruler creates 15 1/2″ blocks. If you are making the largest size block, you can just cut around the edge — no need to mark. There are also marking guides at 12 1/2″ and 10 1/2″ to zoom in on smaller motifs or to use on smaller shirts. You may use any combination of the inner marking guides and outer marking guides to create rectangular shapes for t-shirt motifs that are either tall and narrow or wide and short. Or align your ruler to make a block on point. 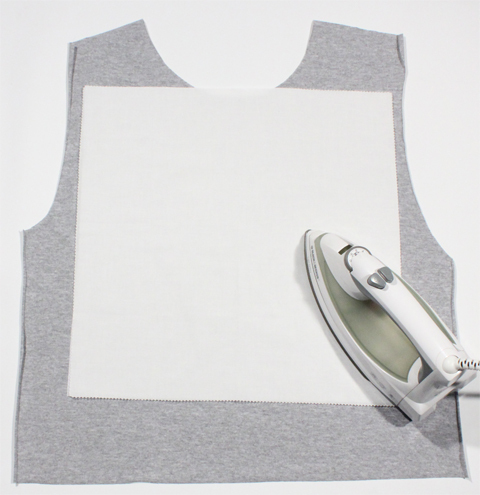 Use your favorite marking pen to mark the cutting lines on the t-shirt. Once you have created your marking lines, slide the straight edge of your ruler over until it is aligned with your marks and rotary cut. Repeat this for all four sides of your block. Your t-shirt block is now ready to be sewn to your sashing strips or to another t-shirt block. If you do not have a quilt design in mind, try one of these patterns from the June Tailor Website. If you are not quite ready to tackle a large project like a quilt, you can use the blocks to create scarves, totes, pillows or wall-hangings. When you have completed this project, store your T-Shirt Transformation Ruler on the June Tailor Rule Your Rulers quilt ruler organizer. I will be giving away one each of our T-Shirt Transformation rulers, T-Shirt Project Fusible Interfacing and the Rule Your Rulers to one lucky winner! To enter, please leave a comment about what your first t-shirt project will be! You will have until September 30th at midnight to comment. All winners will be randomly selected and announced on Moda. . .The Cutting Table Blog on October 2nd. Make sure to visit the blog every day for opportunity to win each giveaway! Previous Previous post: The Binding Tool & Mini! Oh my that would be an amazing tool to help me tackle the bag of t- shirts from my sons high school years! What a great give away! That ruler would have reeeeeeally helped when I made my t-shirt quilt last winter! For my next project, I’m going to make one of those cute drawstring backpacks for my son. Really love the scarf idea! I would do that first for sure! My husband and I have worked at Christian camps for over 30 years. I would make a quilt out of some of the annual camp t-shirts we’ve collected over the years. My son has tons of rock bands tee’s that need this ruler! I’ve made a number of T quilts over time, but I really like the idea of the scarf and would love to give that a try. This is a great ruler! I have thought about making one but I am afraid of messing up when I am cutting my t-shirts that I would not be able to use them. I think my problems have been solved with this ruler! Thanks for a great giveaway! I have had a bag of my granddaughters high school athletic t-shirts sitting on a shelf for several years. Time to get it done! That June Taylor kit sure would help. Thanks for the chance. My son has a collection of Hard Rock Cafe t-shirts that are no longer his size and I want to make them into a quilt for him. This is my next project! Thanks for the tips on how to make one. Looking forward to winning! My uncle recently passed away, and my aunt has requested 3 quilts to be made from his shirts, one for each grandchild. Wow, that ruler is here at the right time. I just pulled up all my son’s t-shirts from sports, and all his school years and I’m about ready to start cutting up t-shirts. He moved into his first apartment at college and I wanted to make a t-shirt quilt for him to give to him at Christmas. I have my setting for the quilt all picked out, just afraid to get started. I’d love to be included into your giveaway. I have been asked several times to make Tshirt quilts but never have known the proper way to do it. Now I think I am ready to tackle trying and will make a scarf as my first project. Thanks for the tutorial! My first T-shirt project will be a quilt for my grandson, and it will be happening the second week in October because I am heading to my daughter’s for a visit and she wants me to help her make one! Would love to win these tools to assist us in our project together. I have made a few T-shirt quilts and this tool looks like it would save me lots of time. I will make a quilt for my son. I already have a bag of t shirts waiting. Thanks for the chance to win. I wear my t-shirts until they’re worn threadbare, but when my son moved out he left a closet full of tshirts that I have been thinking about making into a throw for him. This tool would give me the perfect motivation! I would probably start with a bag, I have made them before but not from t-shirts. I can’t convince myself to try a quilt yet after some failed simple quilts a number of years ago. I have tshirts from track, VB, BB in high school and college for my daughter. I’m determined to finally make them into a quilt for her. They have been curing for over 10 years. This would make it so much easier! I have a bag of my son’s favorite running event t-shirts in the closet just waiting for me to make a quilt. These tools will make it so much easier because I had NO idea where to start! Oh! This is just what i need! My daughter has a college t-shirt quilt she wants to make and these tools would make it sooo much easier. She’s already rough cut the t-shirts so I’m ready for the tools! Need to make a two sided T shirt quilt for my daughter with all of her college sorority T’s. This would be perfect assist to make it much easier. I have been saving my grandson’s t-shirts and soccer shirts since he started playing soccer at age 3. He is now a junior in High School and I want to get his t-shirt quilt ready for him to take to college with him. this ruler would be the best help ever to accomplish this. Thanks for a chance to win. I just received a box of my son’s t-shirts from his widow this past month. I will be making quilts for her and my daughter in his honor. Fantastic products! My daughter has a ton of t-shirts that I could use this tool for making a quilt. Would love to win & thanks for the chance! The first tee shirt quilt I would make would be for my son…I have a collection of penguin tee shirts from when he was little. He still loves penguins…and he’ll be 26 in November! Wow what a great ruler. My son has all his sports T-shirts. This would be a great way to “display” them instead of having them stuffed in a box! Great idea. I’ve got hundreds of t-shirts from my kids years of basketball in high school and college. I wanted to make them each the t-shirt quilts; this would make the job so-o-o-o much easier. I’ve been saving my niece’s t-shirts for years. Her’s would be the first one I did. Thanks for the chance to win. I’ve been wanting to make a t-shirt quilt with old t-shirts from high school for a long time! My husband and I were married at Walt Disney World, and I have picked up a t-shirt every time we’ve been back there since. They would make a special quilt! Thanks for the give away! I’d like to make a t-shirt quilt using the t-shirts my son wore all through high school. If I can get him to give them up. This would be great! 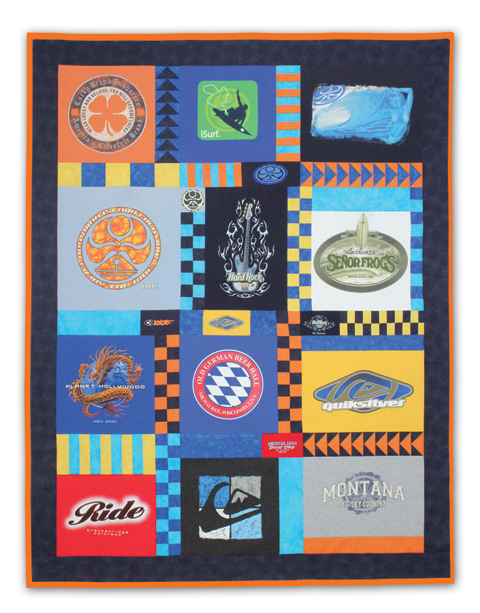 I want to make t-shirt quilts for my nephews college graduation gifts! I plan to make one for my brother with all of his little league t-shirts. I have a collection of Life is Good tshirt seconds with designs of various sizes. This tool would be PERFECT to use. Please Random Number Generator, pick me! I’m making a T-Shirt scarf for my daughter for her upcoming birthday – glad I haven’t started it yet because I NEED this ruler! Thanks for all the great info, this will be my first T-shirt project. Oh I have been wanting this! My husband has about 20 marathon shirts that I am planning to make into a quilt for christmas. What great products! I’ve wanted to make my son a tshirt quilt for a long time,,,and you’ve made it seem “do-able” now! Thanks for the chance to win. What a helpful tool. We’re not lacking t-shirts in this house. My husband travels a decent amount for work and picks up t-shirts for my kids when he goes. I’d love to make a quilt out of the shirts they’ve outgrown! Thanks for the chance to win! I have a pile of t-shirts from my late father-in-law that need to be made into a quilt for my mother-in-law. This package would so help me get over the fear of messing this project up! I actually made several t shirt quilts many years ago. I wish I had the ruler and backing back then. It was even before I knew about rotary cutters. I have many years of my husband’s t shirts again and would like to do a better job this time. Thanks. I am just starting my first t-shirt quilt, and oh boy, could I ever use your rulers! Thanks for the great tutorial. I’ve made a couple of t-shirt quilts and would have loved to have this ruler. I can see so many uses beyond t-shirt quilts too. Would love to win one! Thanks for the chance. I have many wizard of oz t-shirts that I want to make into a quilt. These tools will be wonderful in accomplishing my goal. What great tools! I have a large bag full of my daughter’s T-shirts. Every once in awhile she asks about her quilt. These tools give me confidence I could do it! Would love to win. 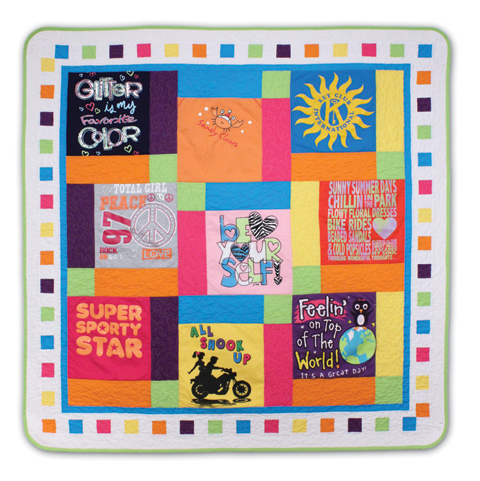 This T shirt tool will surely take the guess work out of how to create a cool T shirt quilt. I will be making a t-shirt quilt for my son and his wife from their college days. Amazing tool.I`d make a quilt for me.Thanks! Oh, what perfect timing! I have been asked by a friend at church to help create a t-shirt quilt for her son graduating from high school. I have been sort of stalled but this post has lit a fire under me to get started! My sons have got a lot of T-shirts from college; I would have a go at then first. I just love the tools you give us a chance to win, Hope it’s me. I have a lot of t-shirts and need to do something with them. Thanks again, good luck to everyone. June’s t-shirt tools would make quick work of a t-shirt quilt I have in mind. I’d like to take all the t-Shirts from past “Salazar” Family Reunions and make a quilt to give away as a prize at our next family reunion. i’d like to make my first one for my grandson. This ruler/stabilizer would be a necessity. My boyfriend has a t-shirt obsession, and hates throwing them away. He does need to get rid of quite a few old ones, so my first projects would involve persuading him to let me make him a quilt with them. I have tshirts for me, and tshirts for my husband. I want to make a double sided quilt combining our memories! WOW! What a wonderful product and tutorial. I have made a couple of tshirt quilts…and invented some bad words during part of the process. Your new product backing and the ruler will make future tshirt quilts (I have committed to make one for each of our adult kiddos) easier and eliminate the bad words during the process!!! Mahalo nui loa from your friend on Kauai! In the process of downsizing for a move and came across the bag of my son’s rowing t-shirts. That is the quilt I would like to do for him so that he will remember how important his athletics were in shaping the man he has become. Thanks for the opportunity to win the right tools. Would love to win as I have saved t-shirts for both my boys from grade school thru high school and this would make it so much easier for me to do. thanks for the opportunity to win. I’ve got T-shirts from places I’ve worked and HS reunions. Thing those would make a cute lap throw. Thanks for the tutorial, the inspiration and the chance to win the ruler +!!! I have been looking forward to making one of these for my son! I have a huge collection of t-shirts that I’ve been saving to make a quilt but slightly intimated. I love this ruler. It’ll definitely help me. I MUST make this quilt! Great giveaway. Thanks. This is an ideal tutorial and tool! I have an athletic niece who will be graduating from HS this year, and what a wonderful gift to make with all her tees from Volleyball and soccer!!! My son will earn his Eagle Scout rank in the next year and I’m getting ready to start cutting his tees from his 10 years in Scouting into a memory quilt for his Eagle ceremony. This equipment would make it soooo much easier! I have a collection of t-shirts from my travels that I will put in a quilt. Some are really interesting and fun. Thank you for this offer and the great tutorial. I have made 2 T-shirt quilts, I would love to have the rulers! I did not use backing for them and they turned out fine. I have a t-shirt quilt coming up for a grandson & this sure likes like it would make the process easier. Sure wish I had this when I made my granddaughters T-Shirt quilt. 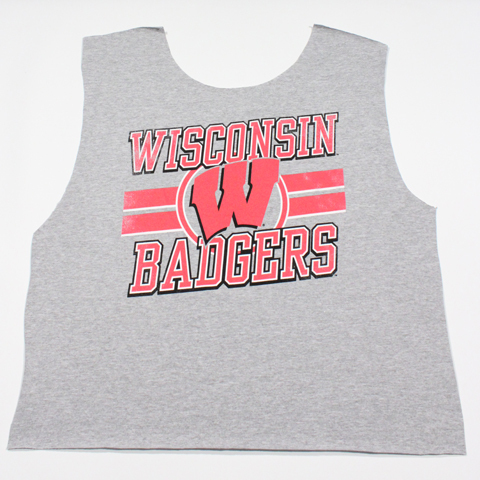 But she is now saving her college shirts for me to make another one. Thanks for the chance to win this ruler. My oldest granddaughter has requested a tee shirt quilt for Christmas…these June Tailor tools would help me get it done on time. I was so excited to see this particular give away. Now to get her to give me the tees. Your video was very well done. Yes those shirts from my son’s college years would look great in a T-shirt quilt and I would have more precise results using your ruler! Thanks for the great giveaway! I have been wanting one of these rulers for a long time 🙂 Such a handy tool! I have several Kliban the Cat t shirts that I want to make into a t shirt quilt…actually several quilts as I have been given a lot of them! It would be wonderful to have this ruler to place the designs! My daughter graduated from college in May, and I would love to make a lap quilt for her using her college Tees. Thanks for the give-away! I love T-shirt quilts so this would be very helpful. My husband and I ran one 5k race every month in the year 2000. I’ve been holding on to those t-shirts hoping to make a quilt “one day” – maybe now is the time. . . Your products look wonderful. I’ve made a couple of t-shirt quilts and I can certainly see how the rulers would make things so much easier. I would love to make a quilt for my daughter with all her sorority shirt. I’ve made several t-shirt quilts but this ruler would sure make it a lot easier. I still have some to make for two of my kids. would love to win it! I would make a quilt for a friend’s son who will be graduating this year. I think some of DH’s tee shirts from when he was a 3X could make a great casual quilt for the now size medium man. I want to take my daughter’s t-shirts from college and make her a t shirt quilt for Christmas. She loved going to University of Alabama and also has t-shirts from all the mission trips and church camps she taught during college. I would love to have the tools to make this quilt! My son has been wanting me to make a t-shirt quilt for years and I have been avoiding it like the plague! After reading this post, I think it may be a fun project with the right tools! I would love to make a quilt out of my kids old clothes. I’ve been saving all my daughter’s school/activity t-shirts, and I will be making her a quilt out of them when we send her off to college! I am currently making a T-shirt quilt for my niece which is a long-overdue graduation gift. I am only half-way done. I did a lot of research before I started because I knew the T-shirts had to be stabilized. Little did I know that cutting her T-shirts was going to be challenging because some of the designs butted up against the collar. I didn’t want bulky seams so I trimmed the T-shirts in different sizes and framed them with fabrics my niece chose from my stash. I did tell my niece that some T-shirts just aren’t going to make it in the quilt. When I finish this quilt, I will make my husband a marathon T-shirt quilt. He has collected a lot since he’s been running races for over 20 years. Thank you for the chance to win. I already made a t-shirt quilt for myself, but it would have been much easier with these tools! I think I would make another one for my husband. I have made a few t-shirt quilts, but this will make it much easier. I think the first project I will do will make a quilt from the t-shirts we collected on our first cruise. I would love to use this to make a t-shirt quilt using all my old t-shirts from college! Thanks for the giveaway! I have a boat load of t-shirts that should be put to good use in a quilt! Thanks for the giveaway! I will soon be making a t shirt quilt for one of my daughter’s volleyball teammates, who will be graduating next year. I would love to try these products. Thanks for the chance to win. I have a pile of t-shirts from various trips to turn into a quilt, this would make it so easy. I have made a T-shirt quilt. This ruler appears to be a big help in the cutting department. Keeping my fingers crossed. My son has a lot of t shirts from the 3 years we lived in the states. I would love to make a quilt from them. I would practice with a cushion first. You make it sound easy now….so I’d love to try a tote to begin with then, the sky’s the limit!!! Thanks for the chance! A coworker recently lost his son. I have been thinking about offering to make a t-shirt quilt for him. This might do it! Looks like a great product! This would be an awesome win and my first project would be to make my guy a quilt with his old t-shirts that he won’t water anymore but he can’t part with!! Hi,it will be about fishing for my Grandson! Thanks for sharing! It wouldn’t be my first, but it would probably be my easiest if I had the ruler! =) Special super hero t-shirts for a son. Oh, boy, just in time! One of my nieces (a runner) has asked me to make a quilt out of her shirts from the marathons, halfs, 10Ks, etc. that she has participated in. I can surely use the giveaway items! Thanks. I’d take all those sorority tees in my closet and make them into a throw. Haven’t worn them in almost 15 years, but feel funny about getting rid of them. I made one, my first quilt ever to complete, for my husband using his shooting shirts. He loves it, but there was so much I didn’t know about T-shirt quilts. My daughter has been saving my grandson’s shirts(he’s 6)and mentioned me making him one. I could probably do it with your tools and videos for instruction. Thanks for the chance to win! Oh, I wish these would have been in my stash when I made a t-shirt quilt for my cousin! It would have been so much easier! If I win, I would use them for a quilt for my nieces and nephews. Their moms have already asked me about making them one when they “get done” with the t-shirts. My first t-shirt quilt was a nightmare – it was for a friend’s daughter – and I have never been so glad to get a quilt finished and out of my house!! Having one of these rulers would’ve helped out a great deal!! My daughter’s band Tshirts! She spent 4 years in high school and we have a whole tub full of her shirts! Love this! I would have said a quilt as first project but the scarf is a great idea, too! Thanks for the great tutorial, and the giveaway! I started a tee shirt quilt several years ago so winning this giveaway would give me the push to get out this UFO and finish it. Thanks for the great ideas on making a tee shirt quilt. These would be so helpful!! What great products to get all of those shirts into a quilt. This ruler looks perfect for a t-shirt quilt. I’ve been wanting to make one. I don’t do T-shirt quilts, but this ruler would be perfect for squaring up embroidery for quilts, which I do a lot of. My son-in-law is a two time Olympic Gold Medal winner and I would like to make him 2 wallhangings from his USA Team T-shirts for his 2 daughters. Thanks for the chance to win. a T-Shirt quilt for one of my kids. 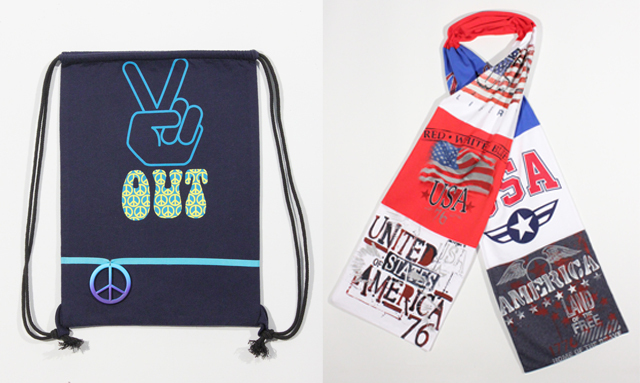 These look like great products to help with my next tshirt quilt!! It would be fun to create a travel tshirt quilt with all the souvenir tees collected. Just starting to quilt and this ruler is definitely going on my wish list! Gathering my son’s t-shirts from his elementary school days- hoping for an a-ha quilting moment once I see them all laid out! I would make a quilt for my daughter from her favourite t shirts. Thanks for the chance to win! Wow! Everyday it gets better. The tools you have introduced me to are genius. My husband has two beautiful T shirt quilts that we paid a lot of money for because I was too afraid to make them. They are from T shirts from marathons, triathlons and ironman races that he has participated in. I have a stack of T shirts that my son has from swimming that he wants made into a quilt. They are irreplaceable from national swim meets, sectional swim meets etc. He won’t let me send them off to be made he wants me to make the quilt. No pressure huh. I think with these tools and watching the video I CAN DO IT. Would love to win these but if not I will purchase them for the project. I want to take all my nursing t-shirts and make a throw quilt. We usually bought these specially designed t-shirts each year to wear at work on a special nurses week day. Just the other day, I came across a skimpy camisole-style t-shirt from the 20th anniversary tour of a band that I used to love watching in concert. Since I will no longer wear the shirt (too old to wear something so baring! ), it would be fun to make it into a tote bag. I have made about 6 t-shirt quilts. This ruler would be a great help! I always use interfacing and would like to try this interfacing. I would love to win this set of rulers to help me with my tshirt quilt! I am already saving my kids tshirts to make a quilt later. I would make a t shirt quilt with all my husbands old Harley shirts. I could collect all my husband’s car cruise tshirts that no longer fit him and make a picnic blanket to take on our cruises! Thanks for the opportunity to win! I have a bunch of old concert t-shirts I’ve been saving forever. I usually wear my t-shirts to death, so I don’t have many to turn into a memory quilt. I’ve already made a couple t-shirt quilts, but this will make it so much easier. Need to make one for nephews graduation. I have made two for my daughters, and now I’m in line to do another and I’d like the extra help this ruler gives. I’ve never made a t shirt quilt – I’d like to have a go! I’ve made quite a few t-shirt quilts but I think these tools would be especially useful for my next project. I have 3 memory quilts to make for a Momma who lost her 7 year old daughter. I am going to make a T-shirt quilt for my husband’s 25th year of business. He has shirts made with the store’s logo twice a year and I have one of each design. These tools would make it so much easier! Oh my goodness, I made 3 of those quilts this summer and I have 2 more to go, that ruler would be awesome! My brother gave me his college tshirts 1 year ago, but they are still in the closet! I would use it on souvenir t-shirts from vacations. I’ll my a college lap quilt! Concert tees in a quilt. I saw a wonderful quilt made of Unshelved t-shirts this June. I would love to make a unique version of my own! Someone wants me to make them a college tshirt. This would be perfect for this quilt. AWESOME tool! I have a huge pile of t-shirts that I have been afraid to cut into…onward to a quilt now that I’ve seen this ruler. Having 6 grandsons (no grandaughters) we have plenty of t-shirts to make quilts. This tool would be great! My first Tshirt quilt would be for my son using his shirts from all the various baseball teams the played for. I’ve never made a T-Shirt quilt because I was always told they were hard to make. With this ruler and stabilizer I think I could handle making one. I’ve had 2 friends ask me to make one for them. Thanks for the chance to win a gift. I have been saving tshirt logos and sometimes just cute little pictures from tshirts. I thought I’d make a wall hanging but now I have so many it may be a quilt. Thanks for the giveaway. My first t-shirt project would be to take all the conference t-shirts that we have been given – and the bags too and use this terrific template to cut them – then a wonderful quilt would be the result! Thanks for putting my name in the hat for the drawing! I haven’t had the courage to start a tee shirt quilt but I have a ton of shirts from my daughter’s high school days. I would make her a quilt. So happy to see how easy these tools make the process. U of M tshirts for my boys! thank you! That sure would make it easier to make T-shirt quilts. What a great tool! I want to make a scarf. My husband has run in over 25 “Crim 10 Mile” races in Flint, MI and has never worn any of his shirts. I would love to make him a quilt from them. I have been tempted to try a t-shirt quilt. Thanks for the tips and the ruler would certainly simplify cutting. Just dropped off my first t-shirt quilt at the longarmer, but I need to make one for second son now. I could have used this ruler and some better interfacing! Lesson learned. Thanks for the giveaway! my son wants a UT (University of Texas) t-shirt quilt. My first t shirt project will be for a Christmas present. I am using my son’s favorite t shirts to make him a throw quilt. I have done a few t-shirt makeovers; however, I have many t-shirts waiting for a quilt someday. My second t-shirt quilt will be worked on a sewtreat the first of October. I made my first a two years ago at a sewtreat. My son gave me enough t-shirts for four or five using t-shirts on both sides!! Looks like a great ruler! My grands are just about to enter high school and I know there will be lots of tees and lots of pleas for pillows and quilts – I’ll be prepared. I would love to have this ruler to make my son-in-law a quilt of his University of Louisville NCAA basketball championship t-shirts. I’ve been saving up the cute little shirts my daughter wears since she was born. She’s 4 now, and I have a ton! This would be perfect! With 3 active boys, I don’t think I would lack for a t-shirt quilt project! :o) Thanks for the giveaway! LOL my kids each have a garbage bag of t-shirts saved for me to make them quilts! I had no idea how to do it, so they sit. I would love to win your rulers! Thanks for the chance! I have a friend whose son has passed away and she asked if I would make a quilt out of his Tshirts. I have never made one before. If I win this, I can try with confidence! My husband has been asking (nagging) me to make him a Nebraska Cornhusker t-shirt quilt. I wish I had known about your ruler before the season had started. I think I would start with a pillow for my son. My first project will be my fiance’s college tee shirts. My mom passed away 7 years ago and I still have the various t-shirts she wore. I have been wanting to make a quilt out of her t-shirts for some time. This ruler sure would be handy to help me accomplish this goal. I can never bring my mom back but I could always have a piece of her close to me with a quilt made out of her t-shirts. I’m planning to make a quilt for my son with all of his baseball t-shirts – this would be great! I so need this ruler!! My hubby has a bajillion (okay, not that many but still!) Harley Davidson tshirts that are either way too big or stained and I’d love to make a quilt with the ones he doesn’t wear anymore…this ruler would do the trick so easily!! My first T-shirt quilt will be my son’s favorite character – Thomas the Tank Engine. Yes, we had enough different Thomas shirts when he was little to make a play quilt out of for his son someday! I have made several T-shirt quilts. Everyone was a trial and error and I said never again, but now I would love to make another one using your products. I am always having conversations with people because they always want to make a t-shirt quilt and I say Good luck, but now I am inspired. A friend just made a quilt for her son-in-law. He collects Wiley Coyote t-shirts. I have never seen so many shirts, but again it was a trial and error for her. Thank you for this great tutorial. I will use these rulers to make a memorial quilt for a friend who’s son has passed away. Hi there! i just completed my first t-shirt quilt, a very well-received Red Sox quilt for my nephew! I’ve had lots of requests since from other nieces and nephews, so I’d love any ruler that could move me along more quickly, and take the stress out of centering those central designs Thanks for the chance to win! I have a huge box of t-shirts that belong to my daughter. She has been wanting me to make a quilt out of them. This tool would be the ticket to getting started. I love it. My daughter would like to have a t-shirt quilt from her college days. I’d love to give the this offer to her to get her started! My first T project would be for my son, who has saved his T’s for many years for me to create a quilt. But I have been hesitant for years on end. my brother recently made a request that i make him a t-shirt quilt…this tutorial makes it seem like one i could attempt and succeed at. Thanks for the information, and the chance to win. This looks like a great asset in making tshirt quilts. I started one a long time ago and never finished cutting the tshirts! Thank you. I have been saving some old t-shirts for this very thing. Looks like this tool will make the whole process much easier. Thanks for the give-a-way. I would love to win! I have a whole box of t-shirts that belong to my son-in-law and I really need to get working on a quilt for him! I will probably make a quilt with all our civil war reenactment t shirts. My daughter is making tshirt quilts for each of her children and these rulers would help so much! This would help so musch with suilts for my sons and grand children.